Way to take a punch like a champ! This testosterone-drenched painting by George Bellows depicts a typical night at Sharkey’s athletic club. George Bellows, a sports fanatic, was a regular at Sharkey’s and painted many of the muscly, masculine men he met in the gritty bar. It was Bellows’ goal, along with other members of the Aschan School of Art, to depict everyday scenes from their urban landscape. For Bellows, with his studio directly across the street from Sharkey’s, this exciting, covert operation was an image of his every day. Lucky for us he wasn’t neighbors with a boring cobbler, or haberdashery or whatever other kinds of businesses they had in early 20th century NYC. Although this fight club was exclusive, occasionally a few lucky non-members were granted access to participate. These are the men we call “stags.” Makes sense when you see boxers butting heads. Given the poise and ferocity of the fighters, few would know that the men depicted were actually n00bs in the ring! Clearly, Bellows does an amazing job of capturing the energy of our cherished American tradition: beating the crap out of each other. Beautifully executed, this painting appeals to our most primal nature: the thirst for blood, sweat, and aggression. 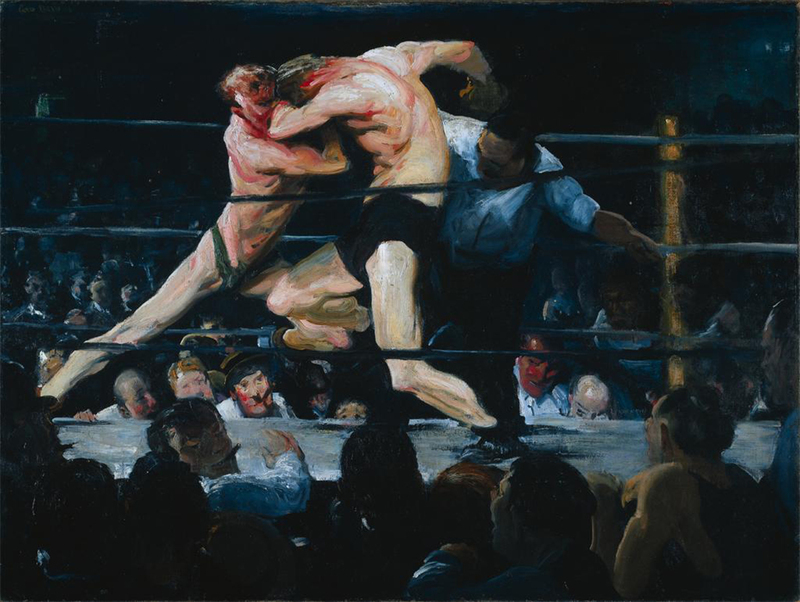 Stag at Sharkey's is a 1909 oil painting by George Wesley Bellows depicting two boxers fighting in the private athletic club situated across from his studio. It is part of the Ashcan School movement known in particular for depicting scenes of daily life in early twentieth century New York City, often in the city's poorer neighborhoods. Bellows used quick strokes to create a blurred image, simulating the two fighters in motion. He also chose a low point of view to put the viewer among the crowd watching the fight. Participants in the boxing ring were usually members of the club, but occasionally outsiders would fight with temporary memberships. These fighters were known as "stags". The painting has been a part of the Cleveland Museum of Art's permanent collection since 1922. Check out the full Wikipedia article about Stag at Sharkey's. Olympic Medalists in ... Art?